Would you like to create an image with faux stitching? If so, check out this step by step Inkscape Extension Tutorial. 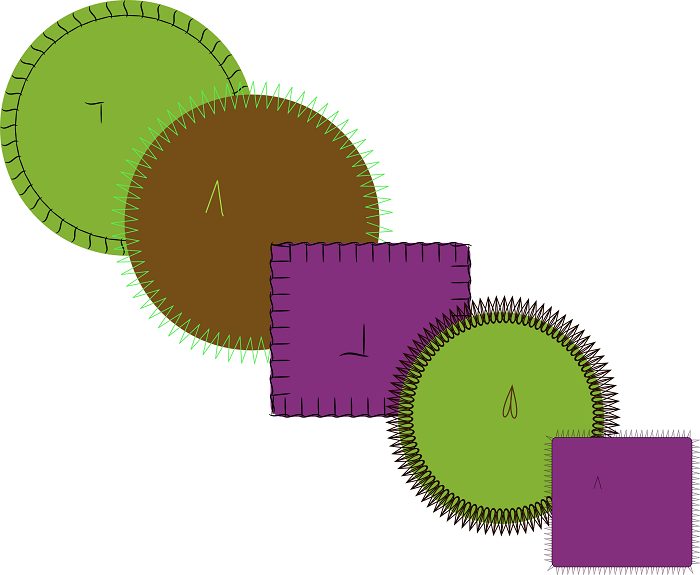 In this tutorial we’ll experiment with using the Scatter Extension in Inkscape to create a few different styles of faux stitching. To create the blanket stitch you’ll need to start with a vertical and a horizontal line. Click on the Straight Line Tool . Now check to be sure that the icon for Create Regular Bezier Path is highlighted. 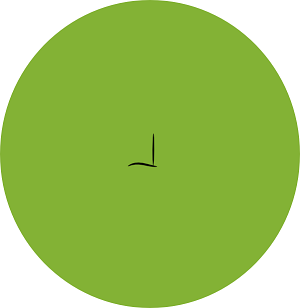 Now for Shape, select Ellipse. (You can select None if you prefer. I used the Ellipse to give it a little more shape.) To create this stitch, I had the best luck if I created it very large and then reduced the size after I made it into a path. You might need to play around with it to get it exactly the size you need. Create a vertical line, and then a horizontal line. Move the handles on the bottom line to create the curve. Move lines together as shown. Select both lines, Path>Objects to Path. Now, Path>Union. Now reduce the size of the “stitch” to match your project. 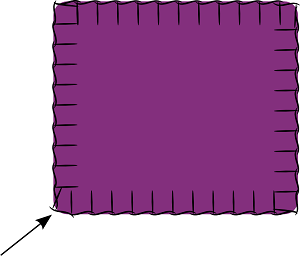 To create a regular Zig-Zaz stitch, use the Straight Line Tool. Select None for the shape. (Again, the shape is your choice.) You can see I got a little sloppy with my stitch here but it really didn’t detract from the results. For the last stitch, make it like the regular Zig-Zag stitch but use the Ellipse shape. Turn it into a Path, turn off the Fill, and turn on the Stroke. It should look something like this. Now, create the shape(s) that you want to add the stitching to. I’ve had best results with circles and curvy shapes. However, with a little tweaking, squares work too. Now take the stitch you created and place it on top of the shape. It doesn’t actually have to be directly on top of the shape, however it does have to be above the shape in terms of layers. 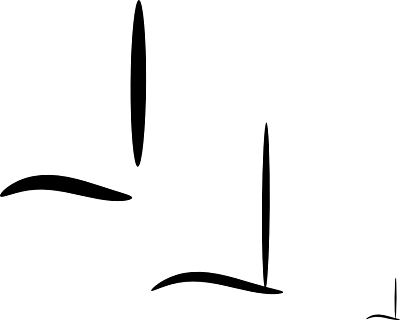 (I find it helpful to put it directly on top so that I can see that is indeed above the shape.) 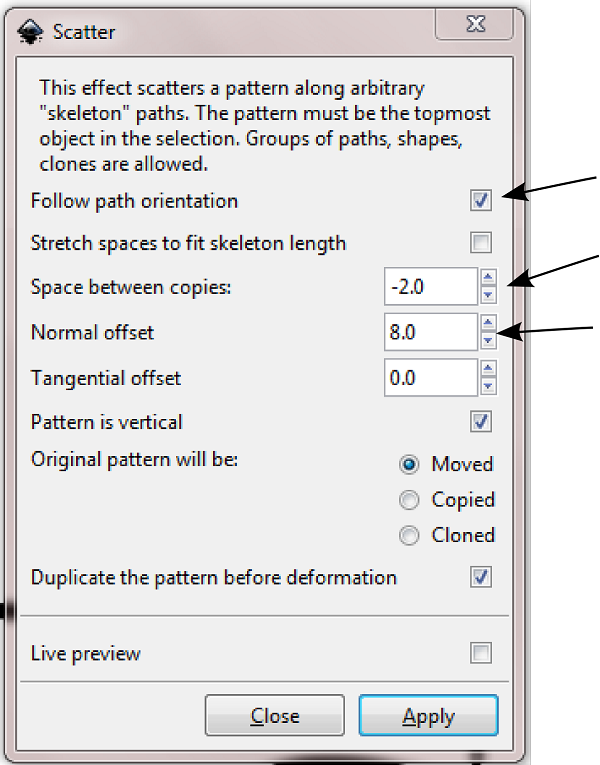 Now select both the stitch and the shape and go to Extensions>Generate from Path>Scatter. This will open the Scatter box. Make sure that Follow Path Orientation is checked. You’ll want to pay attention to Space Between Copies as well. If you are doing a regular Zig-Zag, this should be at zero because you don’t want to overlap your stitches. For the Blanket Stitch, you will want some overlap of stitches so set this value to a negative number. (The exact number depends on the size of the shape and stitch you are working with. You’ll have to experiment a little with this.) The Normal Offset affects how your stitches will be placed on the skeleton (outline of your shape.) For example, I did not want my Blanket Stitches to overlap the shape so I set this value to a positive number. On the other hand, the Zig-Zag stitches needed to overlap the shape so I set the Normal Offset value to zero. In other words, with a setting of zero, there will be overlap. With a positive value it will bring the stitches more inside your shape. And now you have your faux stitching! As I mentioned before, you might need to tweak the stitching just a little if you are going around corners, as you can see from the example of the square below. However, it can be easily fixed by moving a couple stitches. You might also want to experiment with Stretch Spaces to Fit Skeleton Length in the Scatter box. I have not really experimented with that setting much. Now give it a try and see what you come up with. I’d love to see some of your work! A clear and concise tutorial, reminding me that I need to use the scatter option more often……. Excellent. Another wonderful and easy to follow tutorial. I look forward to each new post and have learnt a lot from you. Thank you. Thanks, Carolyn. I’m glad you find my posts helpful. Have not tried this technique yet. Thank you for providing such clear instructions. Sandy, thank you for letting me know that you found it helpful.